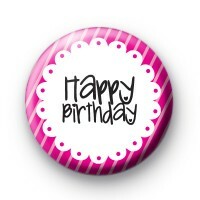 Pretty pink and white badge with the message 'Happy Birthday' written in a fun black font. It is a great badge to help someone celebrate their birthday. Everyone should wear a badge on their special day! We have a huge selection of birthday badges so make sure you take a look at those too.